Half way through...a cup of tea and a small snack really revived me. so I could enjoy the view. Recently I put up new rocks and things that remind me of nature. then it is lovely to bring nature in near me. and started adorning my lace stand with tea cups. Lace and tea cups go well together. I love to collect both! There is something special about a vintage linen napkin with a hand crocheted edge. or any kind of needle work. only just noticed that the other day! He has the rosey glow as Sterling Silver has some copper content. I have had him for at least a dozen year. He just kind of hangs around. I think he is good luck! Just the smell alone can lift my spirit! I am thankful for tea! I hope that you have moments of peace as well. Thank you so much for stopping by for Tea Cup Tuesday! I appreciate all the bloggers who host tea cup fun. back here and link that post up below so we can come and visit you. Don't miss my new Happy Spring and New Class Celebration Giveaway! Click here to see it and enter to win! Every time i post about it you can enter! I just love how you present the cups today and putting them in a lace stand makes a perfect match. I like lace too but somehow never start collecting, maybe one day the bug will bite me ha ha. un beau moment au soleil ! en France il fait gris ! What a lovely sunny spot to have that special cup of tea. 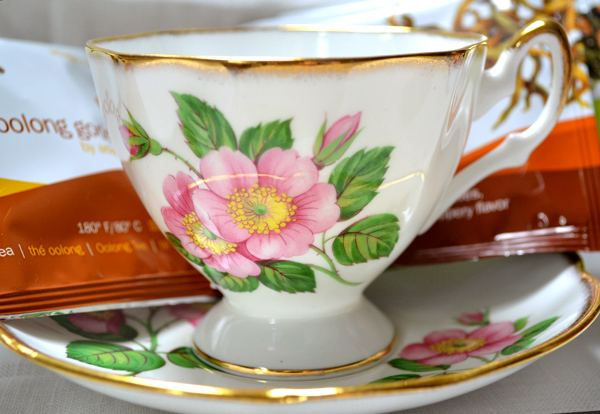 Love the way you have graced your lace stand with those sweet cups! Isn't that the same beautiful lace stand that is in your SOULFUL ADORNMENTS workshop with CREATIVE WORKSHOPS???!!! Some how lace, linen and fine china just go hand in hand especially for me!Love your beautiful pegasus too. I collect lace and I love tatting. Your calico teacup is so pretty and looks so perfect nestled in the lace.Have a lovely week. I'm loving all of that lace! I may have to steal that idea for this year's Senior Tea. Hi Terri, love that floral cup on top, so fresh and dainty looking. I first noticed the rocks in the window though, I am a rock collector and have several of them around my home. I used to collect tea cups years ago and eventually got rid of them. I just do not have the space for collections any more. What a gorgeous post Terri! Love the 3 tiered stand with all that vintage lace and the romantic lace. Almost didn't fall asleep last night - so excited about starting your class! :) Today I plan to play a bit with beads and images...bezels later in the week! Adorning your cake stand with lace and tea cups is definitely not silly. I thought it was clever and very beautiful. I am so impressed with your lace creation - I love this! That was a very creative "break". Oh my, what a yummy post, Terri! LOVE your pretty teacups and that lace stand is scrumptious! I have a stand too but it's not nearly as lovely as this one. 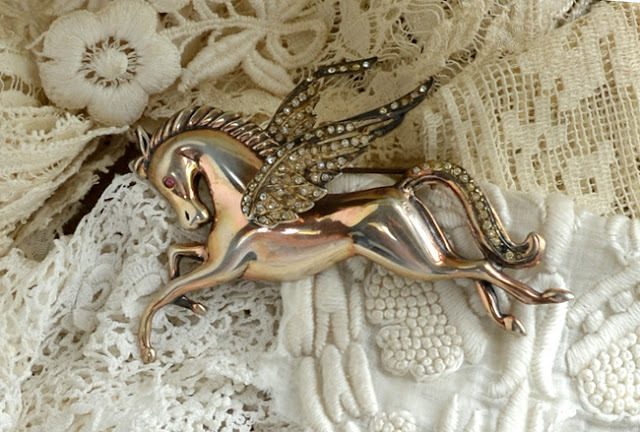 Your little Pegasus is adorable and looks right at home there in all that beautiful lace. Thanks for sharing so much beauty with us and for coming by for tea. Hope you have a magical day. What a delightful spot for tea. Love the tea cups on your lace tower. And thanks for the sweet giveaway. The tea cup is beautiful. Such a pretty tea - love the stand with lace and teacups. And of that pretty rose tea cup give-away - I love that too. what a peaceful setting, Terri. I adore your pegasus and I too would think he is the bringer of good luck : )happy day. so nice to see the sunrays plaing on your tea set. What a luck spring arrived eventually. Mostly I hae my tea break when I make my weekly post. What a duty to enjoy after photographing the tea and snacks. I really love that part. Your lace stand is breathtaking beautiful. And what a creative soul you are to decorate the tea cups there. That looks so beautiful. The little Pegasus is a real treasure. Thank you for this lovely tea time and for hosting this sweet event. Wow, I just love that lace stand. It is so gorgeous. the cups seem to just fit in. I love lace too, can't get enough of it. Hi Terri. Such a pretty post! 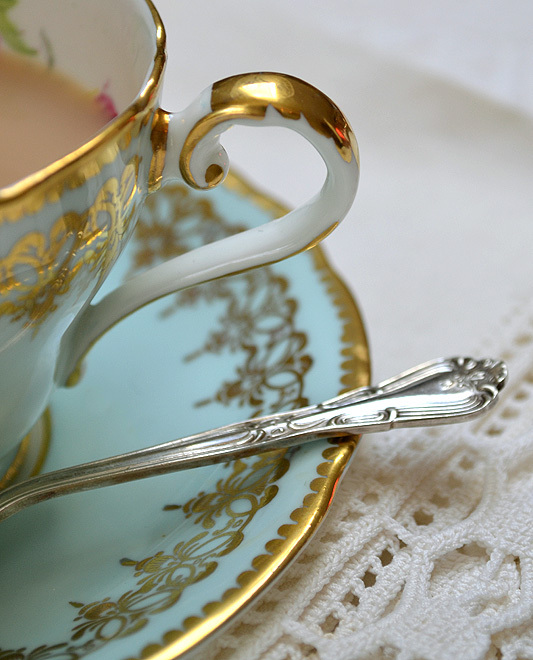 Love the teacup and love old lace. Great work space! Thanks for hosting and have a great week! Well, I'm sitting here enjoying my cup of tea while reading, but my old black mug is a far cry from your beautifully romantic teacups!! (which look wonderful on your lace tiered stand...not silly at all:-)) Please enter me again in you giveaway, and have a wonderful day! Hello Terri!! I popped over here from Pinterest because someone pinned the picture of your LOVELY laces on that gorgeous stand with those beautiful teacups and I was riveted!! You have such an eye for beauty and we are blessed just by looking at it. Lovely post! 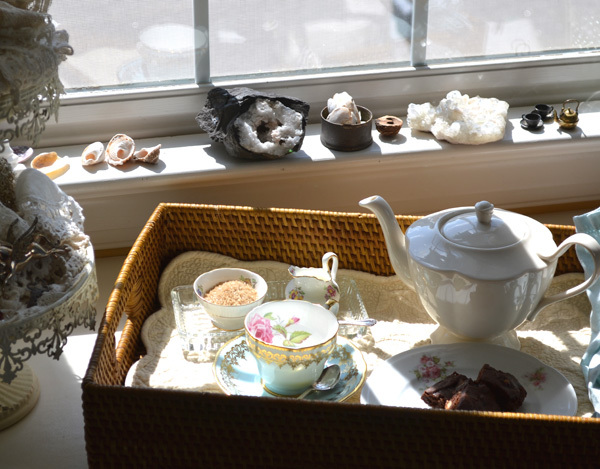 teacups and lace are a natural and are well enjoyed at my place too ! What a lovely thing, your lace stand. And indeed, nature inside is grounding and wonderful. Your photographic skills never cease to amaze me! A moment of peace is at hand, and I thank you for the inspiration. I gave you full credit with a link to your blog, so hopefully you will see more readers come from it! Hi Terri, Your post today is especially beautiful. So much grace and loveliness. Lace always puts me in a state of awe. I think of the nimble and artful fingers creating each tiny stitch. And yes, please enter me in your fabulous giveaway! Holly M.
I love your lace and tea cups photo, your blog always makes me smile. Thanks for all you share. Oh your pictures are amazing - esp that light turquoise cup and silverplated spoon handle, swoon! What a GREAT idea to "feature" your linens and teacups on the 3 tier, grand idea for sure! I always enjoy your posts delivered to my email. One day soon I will join you for a cup of tea. I have a few treasured pieces I collected years ago. Your lace is beautiful. Love your work. Tea in your workshop looks absolutely delightful. You're right, just the scent of the tea is enough to revive one's spirits--and of course, sipping it out of a gorgeous tea cup. Nuevamente gracias por venir a tomar el té a mi humilde casa. Precioso el encaje que nos muestras, adoro todo lo tejido con ganchillo, los encajes, las enaguas antiguas, los manteles bordados con punto cruz... tus tazas bellas. Oh I love all your teacups with the lace! So very pretty! I also like to bring things from the outdoors in so I can enjoy them. It will be awhile before I can even get outdoors with all the snow whe still have! Please enter me in your beautiful giveaway! Such a pretty teacup. Have a wonderful week. I'm so sorry sweet lady for not thanking you after I linked up, but here I am with my G'girls and had to go put them to bed, so I imagine that's what happened!! Oh my goodness, that lace stand is killing me..IT IS GORGEOUS and with the teacups, to die for! 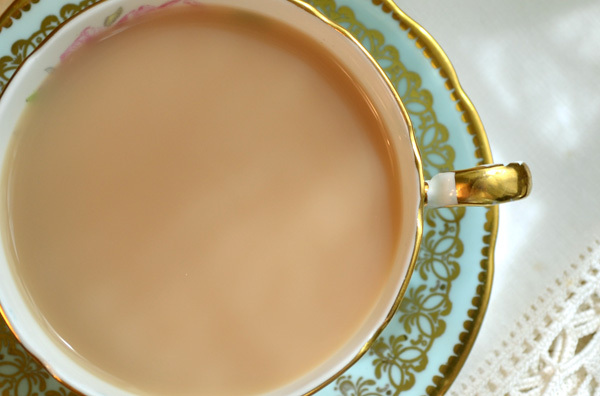 Yes, lace and gorgeous teacups DO go together, like in Downton Abbey! Thank you for your sweet and kind comment and I appreciate you having me at your lovely tea party. Such a pretty post Terri! I love your beautiful tea cups nestled in the lace. Oh, I could just dive into that tower of lace! Just gorgeous! That Pegasus is really something special, too! 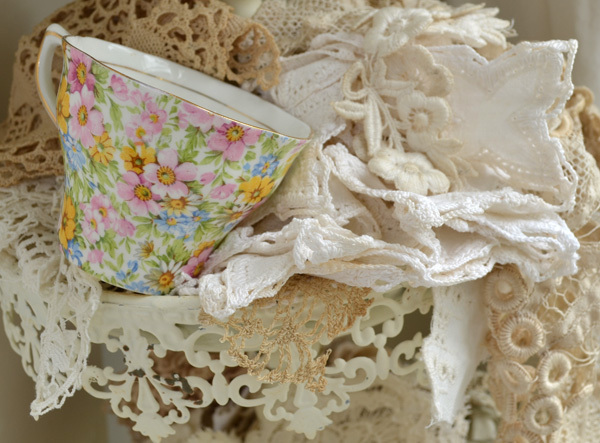 Those teacups look gorgeous on the lace stand, and make for a fabulous photograph too! You alwayes fill me with lovely experiences when visiting you here,- Thankyou for today`s gorgeous view! Here I am again, a day late and a dollar short...ha, but I always smile when I see your gorgeous photos , prettiness, lace, flowers, and bling! Thank you for the dose of cheeriness! I just love your lace stand. It's so beautiful and lacey looking. And of course all the beautiful lace adorning it are lovely. The tea cups accent them perfectly. You are such a inspiration for taking time out for some leisure moments. May your enjoy a delightful day of sunshine,no matter the weather. I'm definitely drooling over the beautiful laces and it's not silly at all to adorn them with tea cups - it's a perfect mix! Your collecting interests are a lot like mine. Lovely photos! I love how you've added some colorful interest to your beautiful collection of lace, Terri! I fell in love with your lace stand ~ SO beautiful and the perfect platform for your beautiful lace! Have a lovely week! Thanks for the fun party and another chance to win! Sweet hugs! Thank you dear Terri for the lovely tea party and for having me again! That lace stand is to die for! Beautiful post. Have a great week. Lovely vignettes... I especially loved the little chintz cup. I like how lace and tea cup looks. It's amazing. Hello...I stumbled here quite by accident but what a pleasent suprise! 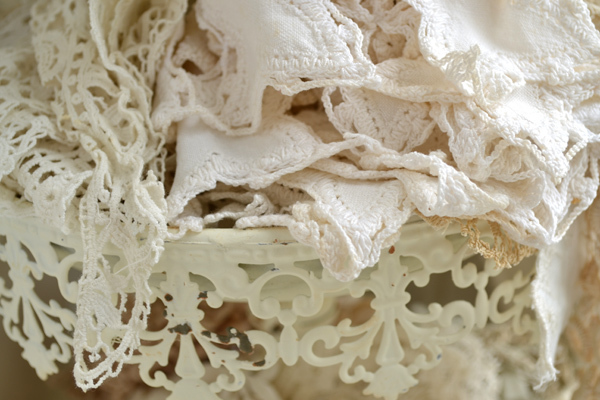 your photos and collection of both china, linen and lace is amazing! a serendipitous find! may I ask if i might where you purchased that breathtaking three tier stand that you so meticulously adorned? i hope i am not out of line in asking. it would be the perfect way to display the petite fours and pastries for my mothers 80th birthday in december. iwould be much abliged for any information available on the piece. i would need at least two. thank you kindly...you have won over a new devoted follower. Love the beauty of your lace stand. You have a divine blogspot. Please tell me where did you get the beautiful cake stand! It is a MUST!!! It is so beautiful!!! New Class and Spring Giveaway!